Day 11 was the last riding day and it turned out to be the overall best. 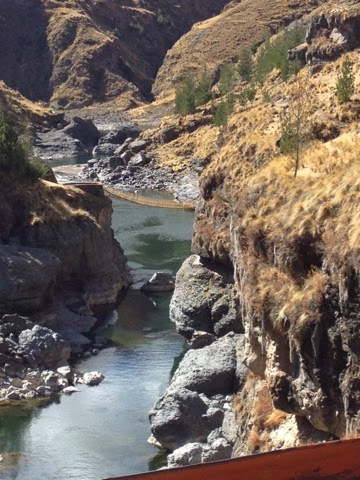 The quest for the day was to find a hanging Inca bridge known as Q'eswachaka. Heading northeast from Espinar was a beautifully smooth paved road that led to the town of Sicuani. There was one section of the road that was still in the process of being paved and this was where the only "issue" of the ride took place when the chain came off my bike. 15 minutes later the bike was fixed and we were on our way. 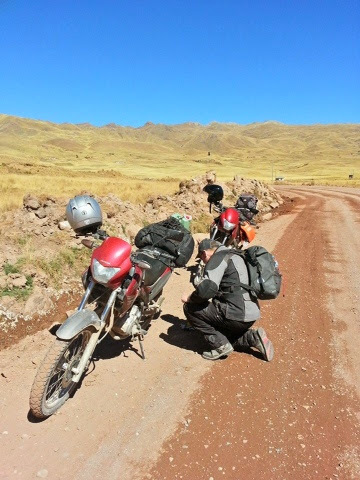 Finding the bridge was difficult as the roads in Peru are poorly marked and many locals were unaware of the bridge. The other "complication" was the information indicated the road to the bridge was made of dirt / gravel and all the roads we were on happened to be paved. We finally found someone who knew where the bridge was and she gave us excellent directions. 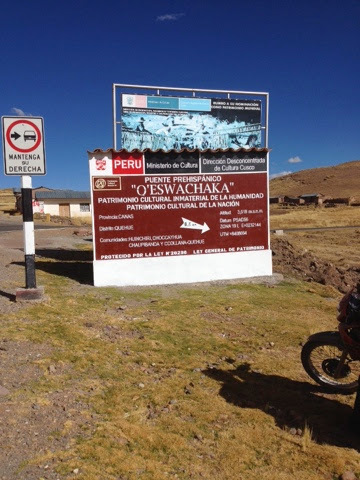 Q'eswachaka is made from local, natural material and is rebuilt every June by the local residents. 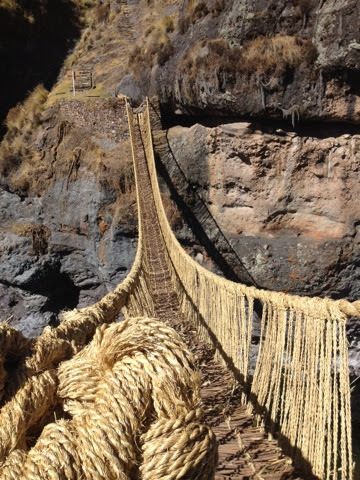 No man made materials are used and the bridge design is consistent with the ancient Inca builds. It was a rush to walk across this structure! The road into the bridge was as much fun as crossing the bridge itself. 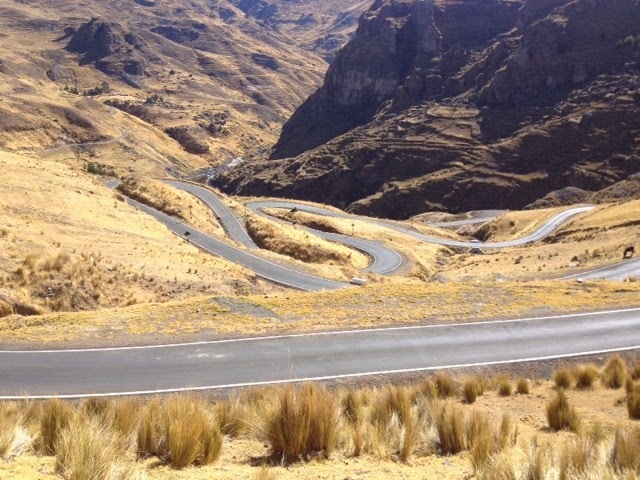 8.5 km of twisting, paved corners with very little traffic. 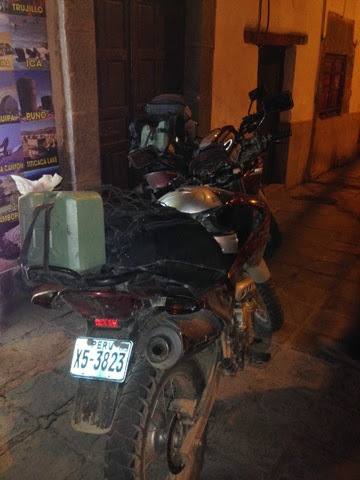 The day and the moto portion of the trip ended back in Cusco, navigating crazy rush hour traffic at night. What a rush that was. 10 days and 2,000 km of riding some beautiful and diverse roads had come to an end. It was awesome!! !